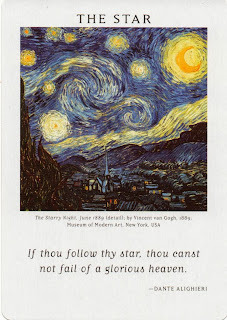 Today's Draw: The Star from the Art of Life Tarot. What is your "star"? Do you know what it is? Are you following it? Today's entry will be the shortest in Daily Draw history. Because the card says it all. And with that, I'm off to follow my star, which is watching the sunset from my favorite location with my favorite critter on earth, Kizzie Sadler (my boy dog). My two girl dogs followed their star earlier today as they sniffed their way through the neighborhood on a walkie with their mommy.